An innovative method for replacing missing teeth, dental implants are the latest in dental treatments to restore the function and aesthetics of your smile. At Caloosa Dental, we provide implant placement as well as custom implant restorations in Fort Myers. Dr. Gear, Dr. Scheel and Dr. Oakes-Lottridge are knowledgeable and experienced in helping patients with missing teeth smile with confidence again. Missing teeth can be detrimental to both your smile and your health. For more information about dental implants, contact our practice today. Implants are a recommended alternative to traditional restorations and prosthetics, such as bridges and dentures, since they provide benefits that extend beyond simple tooth replacement. Dental implants help retain bone structure lost due to missing teeth. Your jaw bone utilizes the roots of teeth to stimulate bone growth and tissue retention, thus supporting itself. Since traditional bridges and removable dentures rest directly on the gums and jaw bone, they do not stimulate bone growth. In fact, over time, they can cause tissue and bone to slowly recede. Dental implants provide a replacement tooth root which does stimulate bone growth and tissue retention, restoring the strength of the jaw bone. Whether you’re missing one tooth or a full arch, dental implant restorations and posts help replace those teeth entirely. If you have been using a denture or partial for some time, and find that they can easily slip or feel ill-fitting in the smile, implant supported bridges and dentures are recommended options. For patients with one or many gaps in their smile, our crowns can be supported by implant posts. At Caloosa Dental, all of our restorations are fabricated to look, feel, and function like natural teeth. 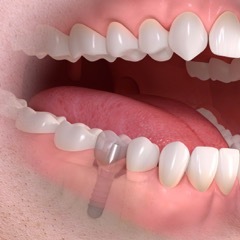 Dental implants only utilize posts to support restorations. This allows for adjacent teeth to stay unaltered and healthy. We begin your implant treatment by inviting you in for a consultation with one of our expert dentists to discuss the procedure and take in-depth images of your jaw. At our Lehigh location, we house a CT Scanner which is ideal for determining the health and density of your jaw bone. From this scan and other x-rays, we can determine your oral health and your candidacy for dental implant placement. Once approved, we discuss options for restorations, which depends on the number of teeth missing in your smile. At the time of your implant placement procedure, we do provide local anesthetics to ease anxiety and increase your comfort. Our Fort Myers dental implant experts take the time to discuss the procedure with you in detail so that you know what to expect. Our front office staff is also here to exude a sense of calm and a reassuring hand for any concerns you may have. Once placement is completed, we invite you back after the recommended three months healing time to begin your final restoration. Caloosa Dental provides expert dental implant services in Fort Myers for patients who desire a reliable solution to missing teeth. Dr. Gear, Dr. Scheel, Dr. Lottridge and the rest of the friendly staff are dedicated to providing quality dental treatments that help restore your smile’s function and overall health. Contact our practice today to schedule your dental implant consultation!